One of the best things about traveling in Japan is the extensive and efficient train system. We took one (usually more than one) almost every day. As a day trip from Tokyo, we travelled north to Nikko, a town with a huge and wooded temple complex designated as a world heritage site. 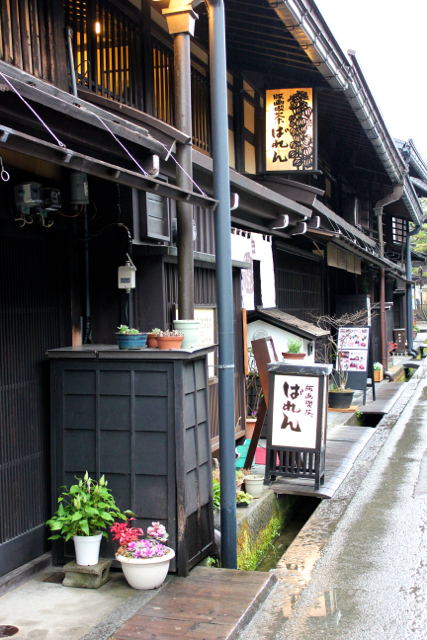 It was in Nikko that we learned a very important lesson: all good things in Japan are uphill. Each impressive temple is either up an incline or flight of stairs– good for burning off lots of tempura, and for providing a beautiful view. 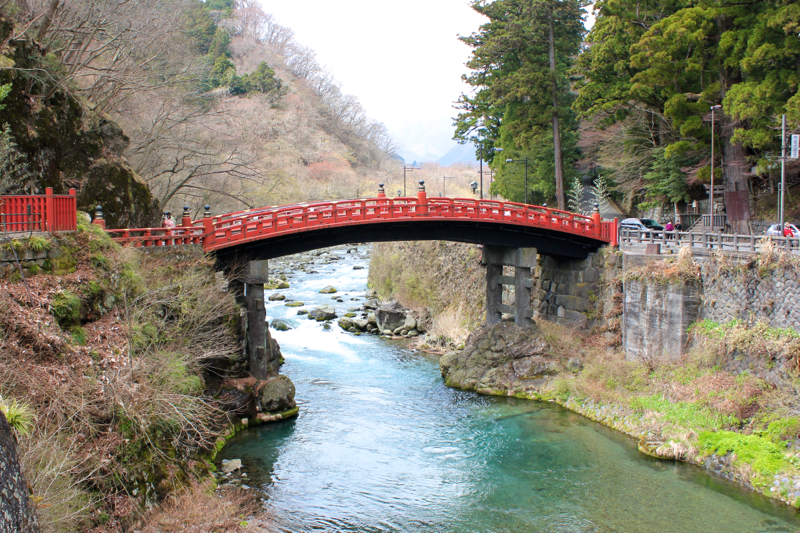 This picturesque scene greeted us in Nikko. The crystal clear snow runoff trickled down from the higher mountains and provided a peaceful soundtrack for our day. 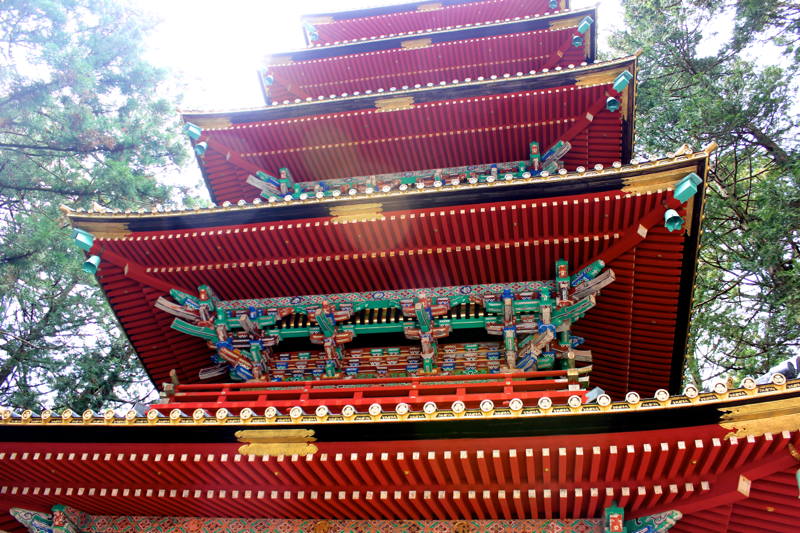 In Nikko, I saw my first Japanese pagoda. Many more followed, but this one was the most colorful. All of the temple buildings were towered by trees that enforced serenity despite the many sightseers. 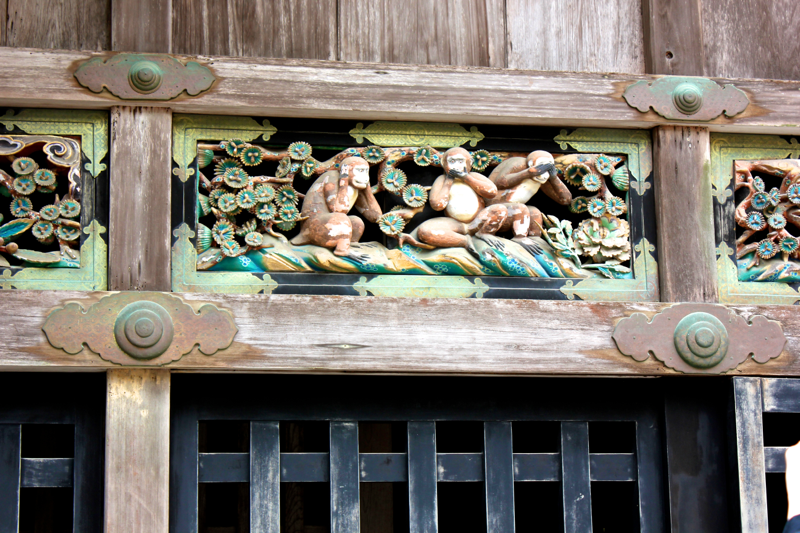 Nikko is home to what are supposed to be the original hear no evil, speak no evil, see no evil monkeys. All of the carvings in Nikko were beautiful, but these were some of the most popular. Also, my visit to Japan made emojis make A LOT more sense. I now can identify and understand the significance of many of the icons, including these three monkeys. 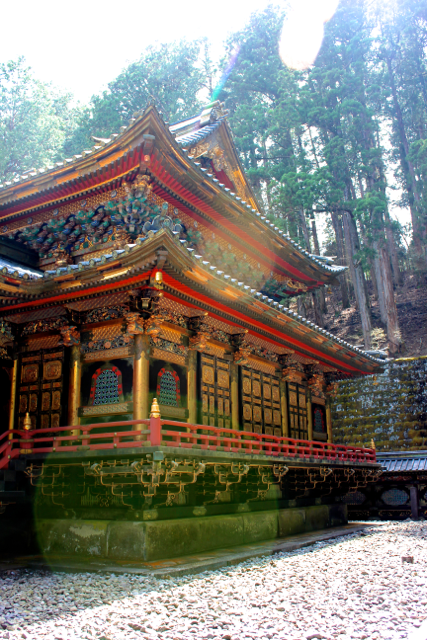 With some wandering in Nikko, it’s easy to come across less crowded, but equally as beautiful, temple buildings. We toured this one behind a group of three bowed Japanese ladies. We could tell by their chatter that they had been friends for a very long time, and they laughed at everything. I admired their chutzpah for climbing the many steps up to the buildings- not an easy task. The crispness of this metalwork stopped me in my tracks every time. It photographs so beautifully, and David loved learning about new dragon breeds! 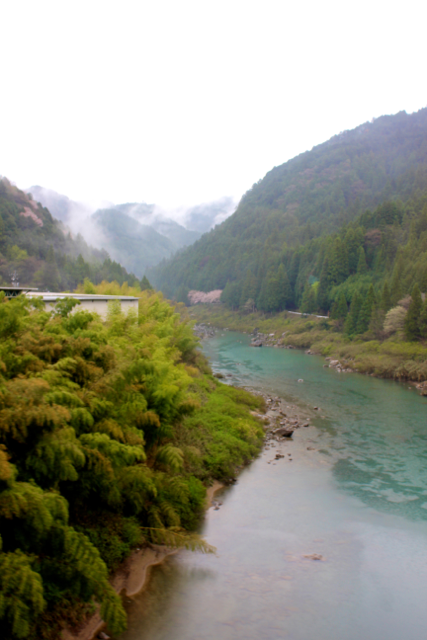 From one day in the mountains to another, we traveled to Takayama, northwest of Tokyo and at the beginning of the Japanese Alps. The view from the train was spectacular. Everyone but the locals was pressed to the windows snapping away. It reminded me a lot of taking the train through the Swiss Alps, but it seemed more lush here. Takayama is a very quaint little town full of traditional architecture and small streets lined with homes, shops, and restaurants. We spent many hours wandering happily. 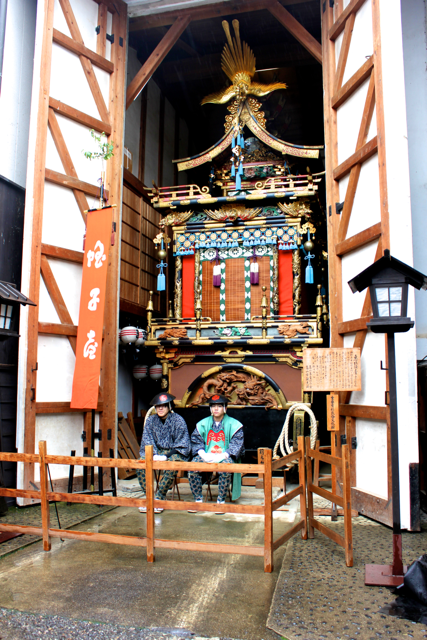 We planned to see the spring festival in Takayama, which is supposed to be one of the most beautiful in Japan, but it got rained out. The ornate floats had to remain indoors. Some of them had animatronic puppets that put on periodic shows. The puppets were both primitive and advanced at the same time- primitive in overall entertainment value, but advanced in that they executed costume changes and could pick up objects! Takayama was full of lots of good shopping. On the left is a store with mounds of miso for sale. On a cold and rainy day, miso soup samples are pretty amazing, and surprisingly common. In the center is a soy sauce producer (also featuring miso soup samples). And on the right is a sake maker (samples, too!). Our favorite snack was a warm kabob of soft rice “crackers” filled with some kind of fruit paste and covered in sesame seeds. I think it’s represented in the emojis. 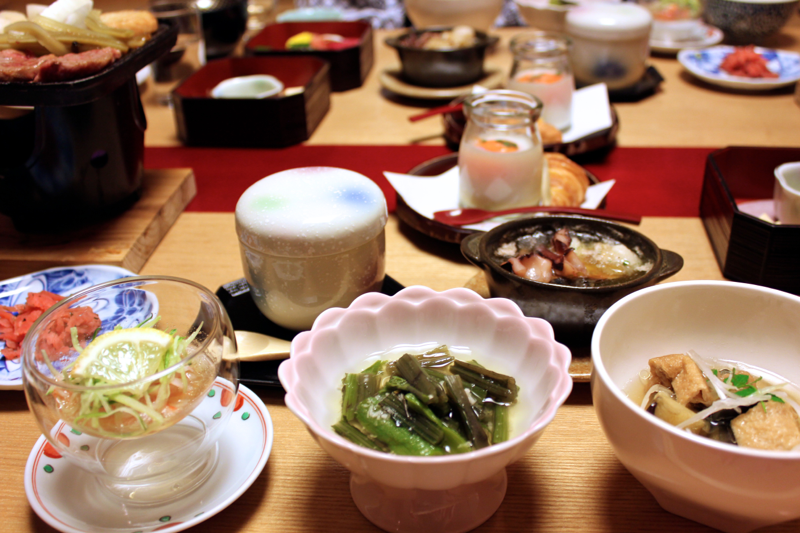 We experienced our first traditional Japanese dinner in Takayama- sitting on the floor and enjoying A LOT of tiny dishes. I learned in Japan that no matter how mysterious something looks, it’s usually delicious. The black tower contained a fire over which we grilled local beef, tofu, and vegetables. The plate with the glass jar contained what can only be described as loose mashed potatoes with an egg yolk(?) and a croissant. The black dish had fish, octopus, and oysters in clarified butter. The white bowl was eggplant and tofu. The lotus bowl had some kind of vegetable, the glass bowl had salmon, the blue plate had something pickled, and I forget what was in the covered bowl, but I think it was good. Not pictured was sashimi, a crab claw, tempura, rice, miso soup, and who knows what else. After that feast, we spent the first of many nights sleeping on the floor using a pillow filled with something that felt like rice. It was fantastic! Wow!! How very interesting!! Beautiful photos!!! It seemed as if it rained a lot.